Launching an employee advocacy program demands a great deal of time and preparation. Communication, events and training can be considered the three main threads of a deployment. But each one consists of multiple elements and, from an overarching perspective, they must come together to form a streamlined strategy. Here are five launch ideas that, when combined, can pave the way for a successful employee advocacy deployment. First, you need to consider when launching an employee advocacy program is how mature your employees are on social media. For example, how many already use social networks in a professional as well as a personal capacity; and, for those who don’t, what are the points that need addressing? 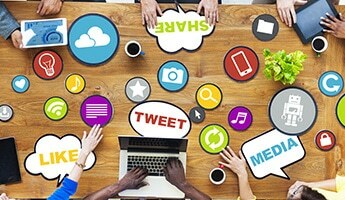 Social media training should adapt to specific user groups; not only in terms of where they are to begin with, but also in terms of what they stand to get out of the employee advocacy program. For sales teams, this may mean focusing on social selling. Meanwhile, for others it might mean honing in on how social media can be used to develop their employability. 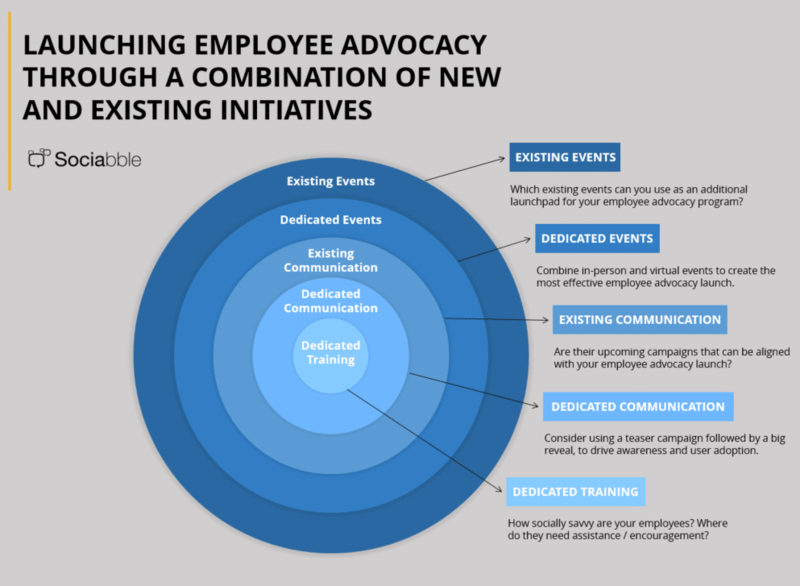 Though training is a core element of any employee advocacy launch, requirements and objectives are different for every company; as well as for sub-user groups within each organization. This is what PwC France set out to address when launching #PwCdigitalpower: a fully branded employee advocacy program built on the notion of superheroes, complete with monthly workshops led by social media coaches and dedicated to best practices. The rules that apply to the launch of a product also apply to an employee advocacy deployment. Teaser campaigns that reveal information gradually, culminating in a big reveal. This is one of the most effective ways of generating curiosity and driving awareness. For example, Calvin College used Twitterto sow the seeds of its program, sharing deliberately ambiguous messages such as “If you want to be an advocate for Calvin College, let us know”. This sparked curiosity among staff and students, many of whom followed up requesting more information. ExterionMedia also took a teaser-oriented approach, sending a letter to 44 ambassadors in different roles and regions, with a single, mysterious message. This was followed by an email inviting the chosen ambassadors to log onto the chosen platform. Then, as teams, they can give the challenge of engaging all other employees. After just two weeks, 83% of employees had already signed up. Alongside the campaigns you implement, consider aligning your employee advocacy launch with initiatives that are already in the pipeline. Product launches, events, and publication releases are great examples; as they provide highly focused content that can serve as the first major content push on your employee advocacy platform. This act an incentive for employees to engage; and it also provides an opportunity to boost the traction of specific, time-sensitive content through users’ sharing activity. 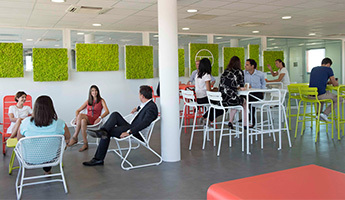 This is exactly what Adecco Group France did, using the launch of an employee advocacy program as an opportunity to promote the re-branding of Adecco, its flagship trademark. Content relating to the “new” Adecco was highlighted on the platform, and users awarded additional points for sharing these posts. Together with dedicated newsletters sent out by platform administrators, this gamification campaign helped the company to generate a social media reach of over six million end users. The most impactful way of launching an employee advocacy program is to make an event of it. But the size and nature of the event will depend on your target user group(s); as well as the scope of the initiative. For example, if you are deploying in stages and starting with the sales team, consider holding an in-person workshop for that select group. Alternatively, if yours is a company-wide launch spanning several locations, perhaps a web-conference that brings everyone together would be more effective. Of course, an employee advocacy launch can combine physical and virtual events. Sage opted for this strategy. The company launched its employee advocacy program during a global web-conference dedicated to social media and associated best practices. 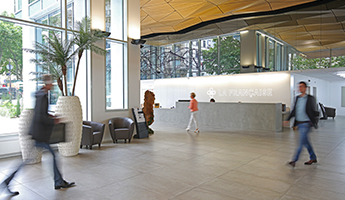 The event, which engaged over 13 000 employees in 23 countries, combined physical events held all over the globe with an online web-conference featuring an intervention by the company CEO. An alternative (or addition) to hosting a dedicated employee advocacy launch event is to use a regular fixture in the company calendar. The advantage of doing this is that you can pick an event that you know is well attended, and capitalize on the resulting visibility. It also enables you to launch your employee advocacy program at an event that hones in on your target audience. At Misys, employee advocacy was launched with the principal objective of facilitating social selling. The company, therefore, chose to launch the program at the global sales kickoff. Along with teaser emails sent leading-up to the event and one-on-one training with sales management; 600 people viewed an introductory video, live on stage. There was also a designated booth that allowed employees to discover the platform for themselves. The ideal employee advocacy launch doesn’t require every single element discussed here. But it should incorporate those that are relevant to your company and your target users. 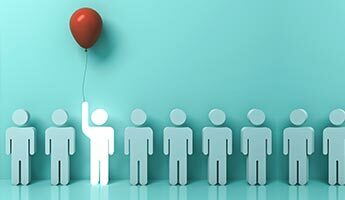 So, whether you use a series of teaser emails to build up to an online conference, or hold in-person workshops to train teams on a departmental basis; the objective is to strike a balance of communication, training and events that readies your company and its teams for a successful employee advocacy program.